Outdoor lighting has come a long way in the past few years, mostly due to the advancements in both batteries and LED technology. This means that you now have a range of really great battery powered alternatives in addition to the tried and true fuel powered lanterns that many of us grew up with. Below we lay out the key considerations you need to make when choosing the best camping light option to suit your needs, followed by our recommended products in the market. For our reviews of the best torches for camping click here. The output from a light source is recorded in Lumens. A minimum level for pottering around camp would be 80-120, and these levels are also perfect for inside your tent. But if you want to light up even a small outdoor area, you should be looking for at least 200. For a larger outdoor area, something around 300 - 400 is ideal. 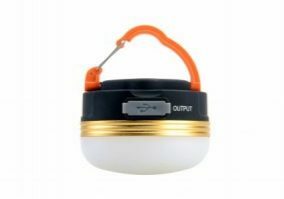 Camping lanterns generally come in the range of 100 - 400 Lumens but as you can see in the reviews below, gas and fuel lanterns often have a light output of up to 1000. Are you going to be off the grid for days? Does your vehicle have a charging outlet? These are key considerations when choosing your source of camp light. The weight of camping lanterns varies dramatically. Whether you are 4WD touring or hiking through the Australian Alps will make a big difference in what the best lighting option is to suit your needs. Will there be children or pets around your campsite? Fuel burning lanterns produce a lot of heat and can result in serious injuries. The advancement of LED lighting provides a great alternative if safety is a concern. Battery lanterns have really come into their own with the introduction of LED lamps and the vast improvement in rechargeable batteries. They are safe, lightweight, durable, and easy to use. For most people camping in Australia, a battery-powered lantern is most likely going to be the best option. They are also coming out with more and more exciting user-focused features, such the alternate power sources offered in our top pick, the OZtrail Escape LED. 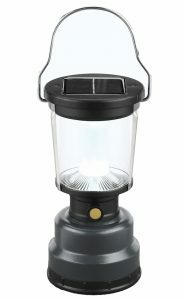 This is an amazing lantern and our favourite of those we review in the search for the best lights for camping. It’s super versatile with the built-in battery being rechargeable via Solar, USB, 12V car plug, or 240V mains power. It also has the option of running on 3 x AAA batteries. 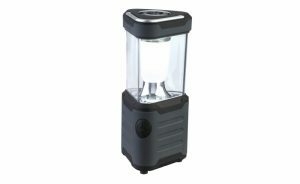 At 500 lumens, this is a very bright lantern, suitable for large outdoor areas. However, with the variable brightness control, it’s also great for smaller sites, as a tent light, or at home. With its sturdy steel construction, it really ticks all the boxes and makes for a great all-around camp light. Recharge times are fairly decent being 3-4hrs for 240 V and ranging from 7-8hrs for 12V and USB and 8-16hrs for solar. Run times are impressive at around 10hrs on recharged battery or 5hrs on AAAs. 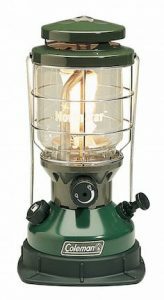 Another great choice, this rugged lantern is made by Coleman, one of the world’s most celebrated camping brands. The key advantage the Coleman lamp has over the Oztrail Escape is its Lithium-Ion battery, which should offer slightly better efficiency both in charging and run-times. Like our top pick, it also offers handy USB charging for phones and other devices. 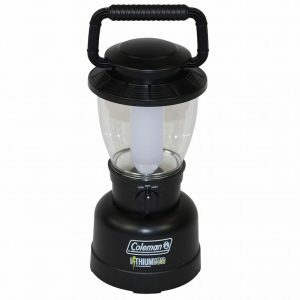 You can’t go wrong with this lantern and with the quality Coleman is known for you can be sure it will last you many adventures. If you’re looking for an affordable, lightweight option for your campsite, the Archer LED from Oztrail provides a great option. With more than 24hrs of battery life and a handy hook for hanging from your tent, these water-resistant lanterns are an easy option for making your campsite a bit easier to navigate once the sun goes down. Great for lighting up campsites or any other outdoor areas, 12V LED lights provide a visually appealing to lanterns or spot lights. More recent products are powered via USB ,making them very versatile. Another great lighting product from Oztrail, the Universal LED Lighting Kit provides a super versatile option for illuminating your outdoor area. The pieces of this kit are easily connected with USB connections meaning you are free to customise your environment. The LED units are magnetic backed, meaning the connect easily to any steel frame, or alternatively velcro tabs and grab clubs allow these LEDs to be easily fixed to your Gazebo or Tent. No wonder these lights are so popular with Australian campers. The smell of burning kerosene holds a special place in many peoples camping memories. 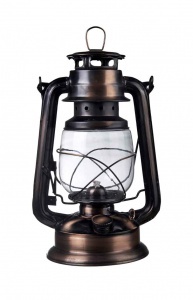 Fuel and gas lanterns have for years been the go to lighting source for the outdoors. They still offer one of the best options if you are looking for an efficient very bright light source. Read on for our top picks in this category. One of the brightest lamps we review, the Coleman Northstar will light up any campsite and beyond. Being powered by Coleman’s liquid fuel with the alternative of unleaded petrol, the Northstar Lamp is versatile, efficient and powerful. The light output is fully adjustable and one tank of fuel should last you around 13-14hrs. While the Northstar does come with a sturdy metal guard to protect against breakages, you do need to be aware that fuel lanterns are more fragile than the battery powered alternatives. They also come with the risks associated with high heat output, making them a less desirable option if young children will be about. 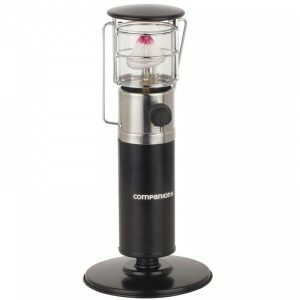 Companion brands are known for producing high quality, rugged outdoor and industrial equipment, and this gas lantern really showcases this and provides a great option for those looking for some serious light on their next camping adventure. Affordable and always handy, tent lights mean less fumbling around in the dark and come with handy hooks so you can secure them up and out of the way of your other camping gear. A very affordable, reliable tent light, perfect to hang in individual bedrooms or main room for family games or meals. 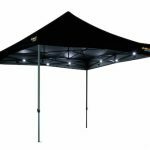 Powerful lighting options built specifically for gazebos, these lights are super bright and designed to connect easily on to your gazebo frame. Specially designed to connect and light up a gazebo, this 4 pack of LED spotlights provide an affordable yet reliable option. Each wide-angle spotlight contains 5 bulbs designed to light up a wide area. 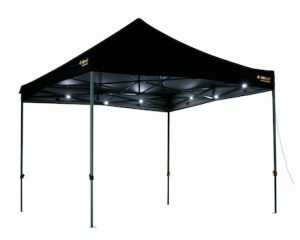 The lights come with a handy clip to connect to gazebos as well as a universal hanging hook to use in other environments.